The Curious Pebble Project: Off to far-flung places, again! Off to far-flung places, again! Oh, my... It's happening again. 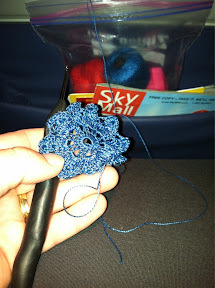 Another cross-country flight with Ziplock full of crochet thread. I had BIG pebbling plans, as we are heading to a beach house at Indian Rocks Beach near Clearwater, Florida--- big plans that is, until my sweetums reminded me that Florida doesn't really have the pebbles I need. I knew that. I just conveniently forgot, ok? Seriously, I spent weeks of each year of my life beachcombing the Gulf Coast of Florida. I have made more tchotchkes out of shells than I should really admit to, and still have bags and boxes stashed away. I even have a very cool shark's teeth shadow-box that I made hanging in my bathroom. Literally hundreds of teeth, a few of which are the giant, pre-historic kind. Remind me to post a pic of that when I get home. It's awesome. No lie. But until then... The question remains: with no pebble-pebbles, just what WILL I make sweaters for and leave on the beach? Sand Dollars? Florida Conchs? Elusive Banded Tulips? What a great post, really interesting to see where they end up.